Iraq has seen more than 3.5 million people return to their area of origin nationwide since the Government of Iraq announced victory over the so-called Islamic State of Iraq and the Levant (ISIL) in December 2017. To help inform programming in support of a durable and safe returns process, REACH is conducting Rapid Overview of Areas of Return (ROAR) assessments in locations where there is a scarcity of publicly available up-to-date information. The ROAR provides insights on what motivates return, along with an overview of the current situation in each assessed area in regard to protection issues, livelihoods and the provision of basis services. Following the first ROAR in Telafar, this ROAR focused on Ba’aj town and its surrounding villages. 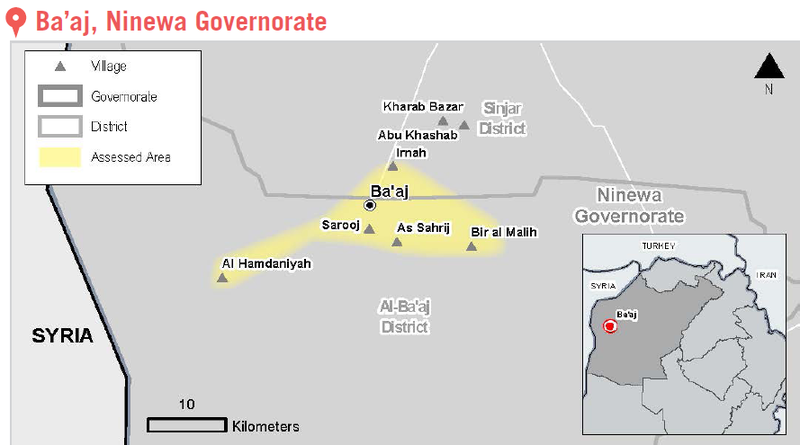 Ba’aj, a town close to the Syrian border in the west of Ninewa governorate, had mostly emptied of residents when the Government of Iraq re-established control in June 2017. Since 2018, around 1,100 families have returned to the town. REACH collected data on Ba’aj between 16 and 23 April 2018 through 28 remote interviews with returnees, Ba’aj residents still displaced in other areas of Iraq, and expert key informants, who were knowledgeable in one or more of the thematic areas covered by the assessment. According to the assessment, the main reason given by returnee informants for coming back to Ba’aj was the perceived improvements to security, whilst those remaining in displacement highlighted that they did so because of the lack of sufficient services and limited livelihood opportunities. Returnees specifically highlighted that agricultural work remains restricted due to the fear of agricultural land containing explosive hazards. Additionally, returnees noted unfavorable weather conditions, such as the scarcity of rainfall, and the lack of machinery as reasons for not returning to Ba’aj. Only basic medical services are reportedly available in Ba’aj town. As a result, residents are forced to travel up to 160 kilometers to Mosul to access appropriate healthcare. Residents of Ba’aj also need to travel to Mosul for obtaining or renewing legal documents. Furthermore, informants reported that electricity from the public grid and water through the public network are not available, making residents dependent on generators and trucked water. Lastly, schools have opened in Ba’aj town, but with limited capacity and resources, leading to low school attendance from surrounding villages. Information from this assessment is key for aid actors response planning and delivery in Ba’aj. The report will help ensure that issues such as lack of water and electricity and limited access to health, education and livelihood opportunities will be prioritized and addressed. REACH will continue to conduct assessments in areas of return, with the next ROAR focusing on Sinjar city. For a more comprehensive overview of findings from the assessment, please visit the REACH Resource Centre and read the full Ba’aj and Surrounding Areas – Rapid Overview of Areas of Return (ROAR) report.